In it’s inaugural tech grant, Monarch Teaching Technologies offered to grant licenses of their award-winning Vizzle to 5 deserving educational institutions who submitted very deserving proposals. For 2010, MTT received hundreds of proposals giving them their judges a difficult task to select just 5 institutions to receive the full Visual Learning TechGrant which comprised of licenses and professional development. As a result, they have decided to provide award levels beyond the original scope of this grant, to acknowledge and support an additional 25 Honorable Mentions and 80 Participation Awards. ASP was one of the lucky 25 Honorable Mention Awardees in this year’s grant awards. “ASP’s proposal was thoughtful and showed great promise for transforming the autism classroom via the power of technology. We are pleased therefore, to support your vision for helping each child reach their potential,” according to Debra Anne Lee, Vizzle Software Consultant. Two among the Honorable Mention awardees were international, Autism Society Philippines and St. Mary’s Children’s Home in Trinidad and Tobago. “We plan to give these two licenses to tech-ready DepEd special education centers," says board trustee, Cristina Estampador. “It’s really timely that the country embraces educational technology, especially for the special needs community. Technology levels the playing field for the disadvantaged as these kids learn differently. It makes differentiated-learning easily doable." 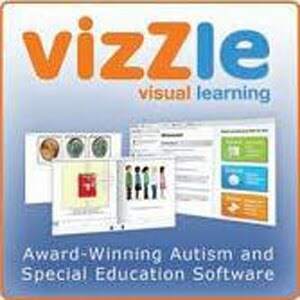 Created by researchers from Children's Hospital Boston/Harvard Medical School and educators from the Monarch School for Children with Autism, VizZle is designed to help children with autism achieve by capitalizing on their visual processing skills and their inherent interest in multimedia. Research shows that children with autism pay more attention and retain more of what they learn when lessons are presented interactively on computers than when the lesson is presented in more traditional verbal/directive methods. Children with autism become very engaged when using computers, touch screens and electronic whiteboards, which can be used with VizZle software. VizZle, short for "visual learning," offers the tools to create lessons as well as a library of thousands of visual lessons made by other users to teach academic and daily life concepts such as emotions. This sounds very interesting. As an institutional member of ASP. will Bridges Foundation, Inc. be granted access to Vizzle? Hi! Thanks for your interest in VizZle. ASP is working on obtaining school and home access for its members at reasonable rates. We will keep you posted of its developments. For inquires, comments, suggestions about VizZle, please email Cristina Estampador at cristina@autismsocietyph.org. Thanks!